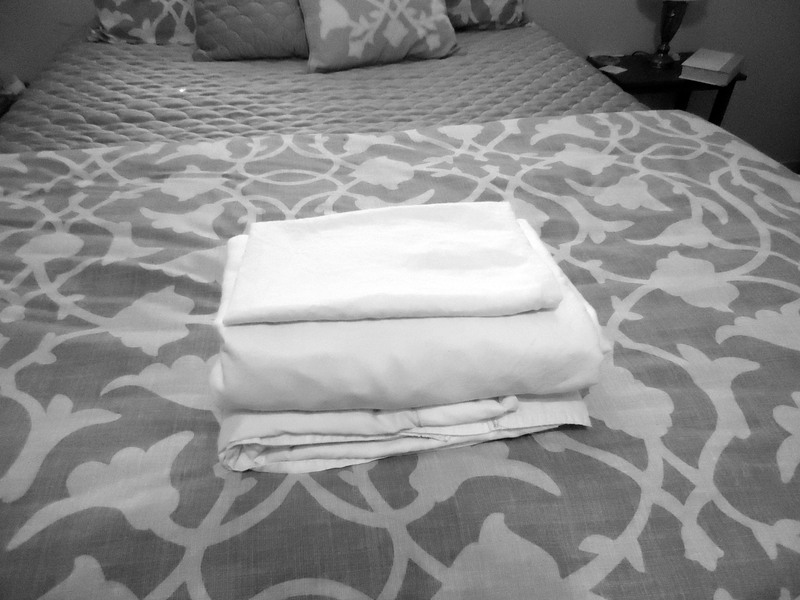 This post is thanks to Laundry Day on Saturday, in which I washed, folded, and put away 1 load of dog blankets, 2 large loads of towels (weighing 46.5 pounds wet), and 3 sets of sheets. Had to wash the dog blankets because I washed the dog (and then had to deep clean the bathroom too – pet peeve: wet hair, dog or human – GROSS); had to weigh the towels because I had to dry them at the nearby laundromat (the fuse box our dryer runs on is currently out of commission) and 30 pounds is the limit to one dryer. 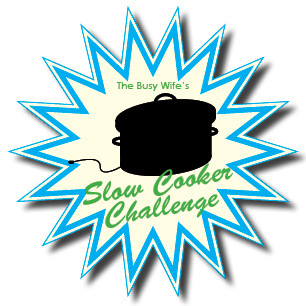 As a disclaimer, I learned this technique ten years ago working for a woman who ran estate sells. Though I’ve used this technique since then, it’s still not easy. And though I’m no master, I am usually pleased with the end result. 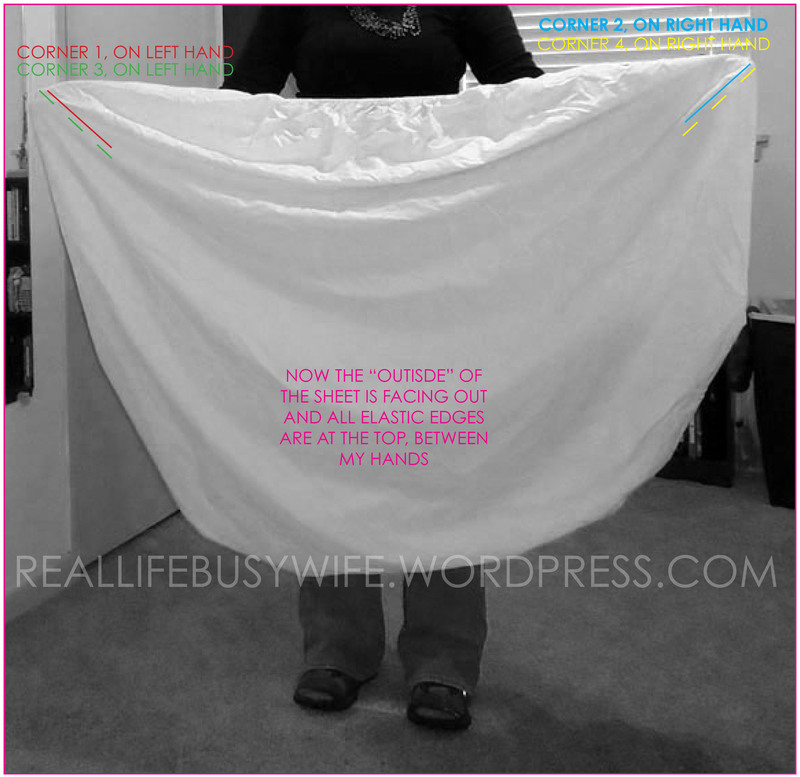 Step 1: Hold the sheet with the outside facing you. Locate the 4 corners. Step 2: Place one corner on one of your hands, and the adjacent corner on the other hand. 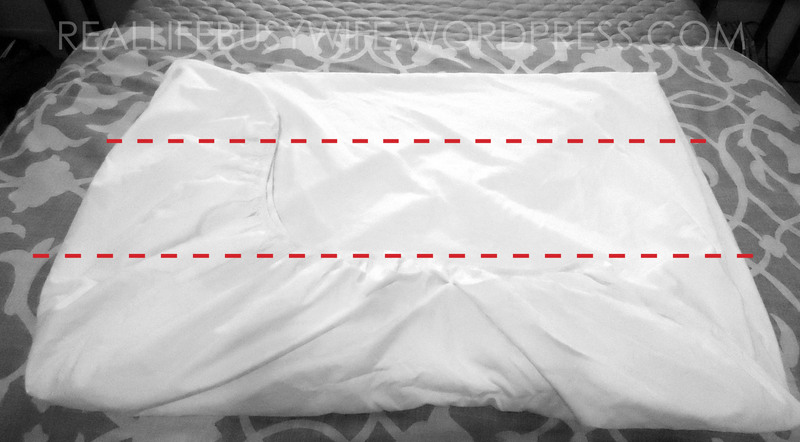 Make sure that the sheet is not twisted. 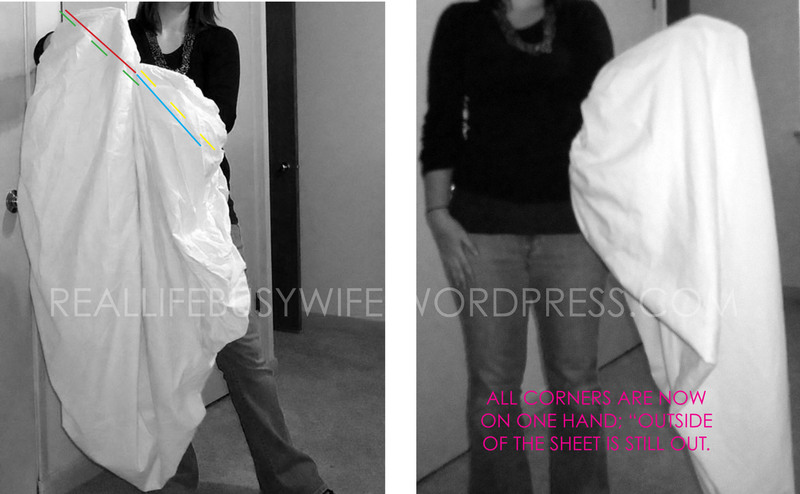 Step 3: With a corner still on each hand, place the corner hanging below each hand on that hand (so that there are two corners on each hand and the sheet is folded in half). You must make sure the sheet is not twisted. To me, this is the hardest part of the process; it often involves setting down one hand’s corners at a time. Step 4: Place all corners on one hand by putting touching the tips of your fingers together and rolling the corners from the top hand onto the other hand. Step 5: Lay the sheet down on a flat surface and pull your hand out. 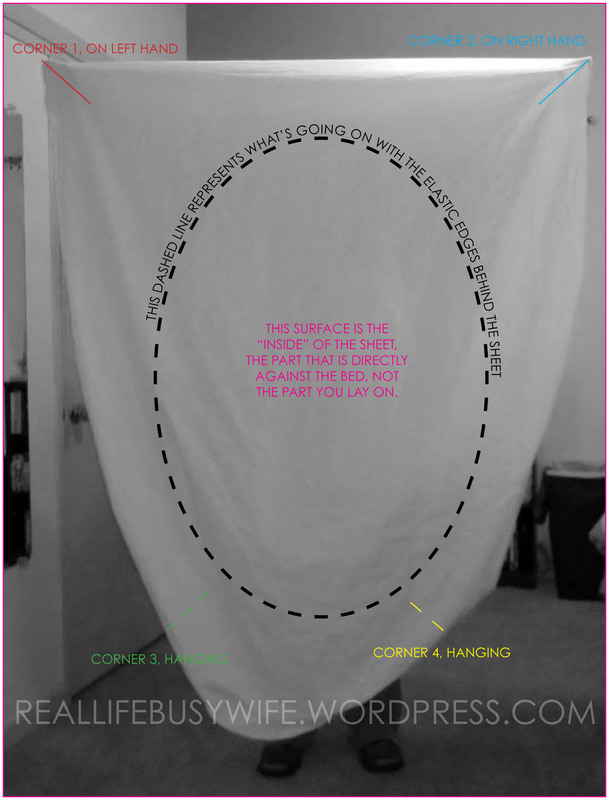 The tips of the corners should become one corner of rectangle that the sheet is now shaped. All elastic edges of the sheet should be towards the center of the rectangle and all edges of the rectangle should be smooth. Step 6: Fold the short side of the rectangle into thirds, hiding the elastic edges. Step 7: Fold the remainder in half, then half again. 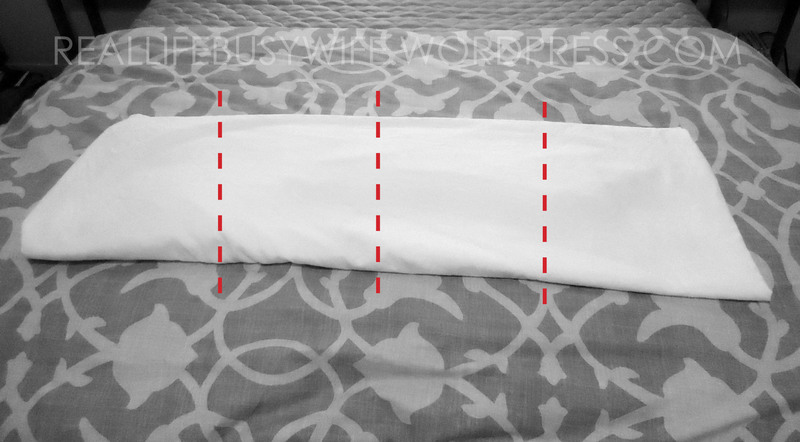 As a bonus, I stack the folded flat sheet, fitted sheet, and one of the pillowcases, then place the stack into the other pillowcase, fold to close and store. As I’ve struggled to perfect this technique, I found this video from Martha Stewart, which shows this process. I do the corners a little differently (my way is easier in my opinion than sliding your hand down and finding one corner at a time; when I tried it this way, the sheet always ended up twisted like the poor lady in the video). You can see that it’s still a battle, even when you know the technique. This is the way my mom taught me when I was growing up.